These days, e-trade is developing faster than most people are able to keep up. On Thursday, June 9, in Pumpehuset in Copenhagen, we therefore did our part to propagate some of the expert knowledge we possess on the subject. 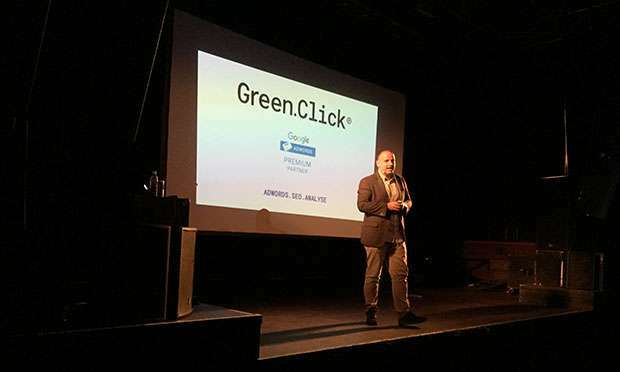 We held an informative seminar in which Green.Click’s Kenneth Jørgensen and Michael Sørensen gave inspiring presentations to a large number of companies quick and lucky enough to have secured seats at the event. Afterwards, the Google representative, Thomas Aebeløe, spoke vividly about the latest data and trends in Denmark that Danish companies will do well to keep an eye on if they are to maximize their chances of online success. Michael’s subsequent presentation buttressed Thomas Aebeløe’s words, as he spoke in detail about how companies strengthen their online positions and create more relevant visits to their webshops. He did this through case presentations and underlined that consumers’ use of mobile phones to find their products and services grows precipitously these days. Danish companies, he said, will do well to keep themselves informed in this area, since internet and retail businesses today fuse together to such a degree that companies no longer have only physical stores but also as a matter of course have e-trade as an important part of their business, whether they are ready for it or not. In connection with the above, it takes knowledge and expertise to survive in the increasingly competitive markets, and we at Green.Click love helping companies succeed. We are true marketing nerds, so when we – as in Pumpehuset – get the chance to tell of our passion and expertise to an attentive business world, we grab that chance immediately. The entire seminar gave the attending companies good insight into the newest marketing trends. Anders, the man behind festivalklar.dk, believed it had given him many techniques and tools to become an even better entrepreneur. It is advantageous to both Green.Click and all companies that knowledge of marketing is wide-spread, since it partly increases our customer base and partly butresses the appreciation of the work we do. We therefore encourage everyone to visit our website and learn more about our marketing solutions and other events in which we have participated. Do also visit our Facebook page and share this blog post with friends and colleagues.